Director: Rian Johnson, US, 2017, 152 mins. From the opening moments of Star Wars: The Last Jedi and we hear John Williams’ well-known music and then see the words on a slant announcing the film, we know that we are about to witness another very special Star Wars movie. And so this is. I won’t attempt to give a full synopsis of the film as it gets quite involved at times and, in any case, you will curse me for telling you what you are waiting to see. So, hopefully, no spoilers here! Star Wars fans will have seen the last film, The Force Awakens, which finished with a glimpse of Luke Skywalker (Mark Hamill). This film continues from that point. Rey (Daisy Ridley) has been searching for Luke. She is somewhat surprised to find him living in isolation in a cave. She pleads with him to return to help his sister Leia (Carrie Fisher) – now General Leia Organa and leader of the Resistance – defeat the First Order. 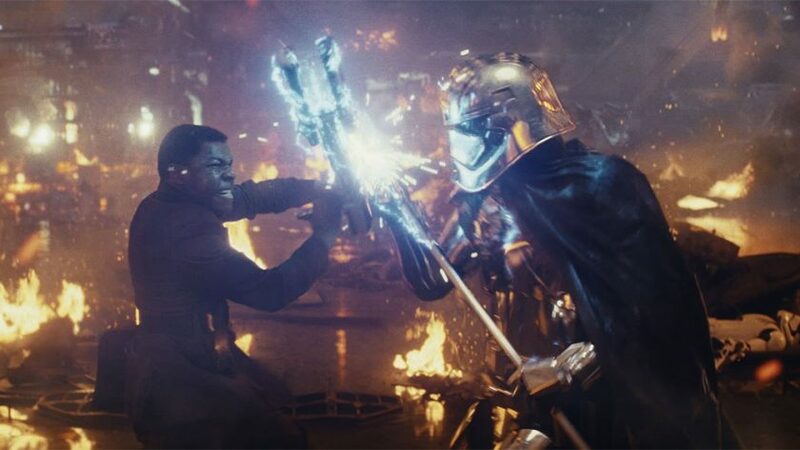 Meanwhile Poe (Oscar Isaac), a top pilot in the Resistance, Finn (John Boyega) originally in the First Order but he defected into the Resistance where he remains, BB8, a new little robot and newcomer Rose Tico (Kelly Marie Tran) a mechanic in the Resistance, set out secretly to disable the tracking device of the First Order. The new characters are particularly impressive: Kelly Marie Tan seems as though her whole heart is laid bare for us to see and Laura Dern as Vice-Admiral Holdo, an officer in the Resistance, is equally impressive. Mark Hamill shows that he can act and not just look like the very attractive young man he showed us in the first film. It’s sad to see Carrie Fisher in her last role. In one interview she said that she didn’t know what was going on but enjoyed making the film! Adam Driver is mesmerizing in the role of Kylo Ren, now Snoke’s servant but famous for being the son of Han Solo and Leia. Snoke, is the Supreme Leader of the First Order and played in full disguise by Andy Serkis. 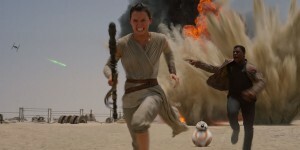 Daisy Ridley continues to grow as an actress and she is self-assured in the part of Rey, a member of the Resistance. And I defy anyone to recognize the lovely Lupita Nyong’o as Maz Kanata, an ally of the Resistance. Allegedly Prince Harry and Prince William play Stormtroopers in one scene but as all the Stormtroopers wear helmets that completely cover their faces it is impossible to know if the scene survives in the final cut. Those who have followed the Star Wars saga carefully from the beginning know all the ins and outs of the characters, their back stories and what is happening in this alternative universe. For the rest of us we can sit back and appreciate the tremendous array of special effects, cute robots and beautifully staged set pieces with shiny computer-generated backdrops. Seeing it on an IMAX screen certainly enhances the scale of the movie and the music swells all around. It’s tremendously exciting to watch, particularly in a cinema full of enthusiastic Star Wars fans. Don’t worry too much about the plot – sit back and enjoy! 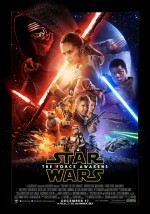 New Poster For Star Wars: The Force Awakens.